Properties in Lucee allow annotating Components with meta data about fields in the component. Properties are most used when creating persistent Entities with the ORM, but they can also be used with POLO (Plain Old Lucee Objects). Any attributes given to the property will appear in this meta data, and this functionality is often used by open source frameworks to dynamically read components and work with it. For example, the Wirebox Dependency Injection framework uses properties to determine how to configure components using the framework. This meta data in of itself is not too interesting for most cases, but properties become more powerful with Lucee Generated Accessors. Properties are also heavily used for the Lucee ORM. See the Lucee ORM documentation for details. The rest of this article will focus on the Generated Method functionality that Lucee provides. Lucee can use properties defined in a component to auto-generate getter and setter methods, set default values, and type check and validate the values. This is very handy for components with a lot of fields, as creating accessors to those fields is a lot of boilerplate code. There are two new functions, getMyValue and setMyValue, Lucee created these automatically. 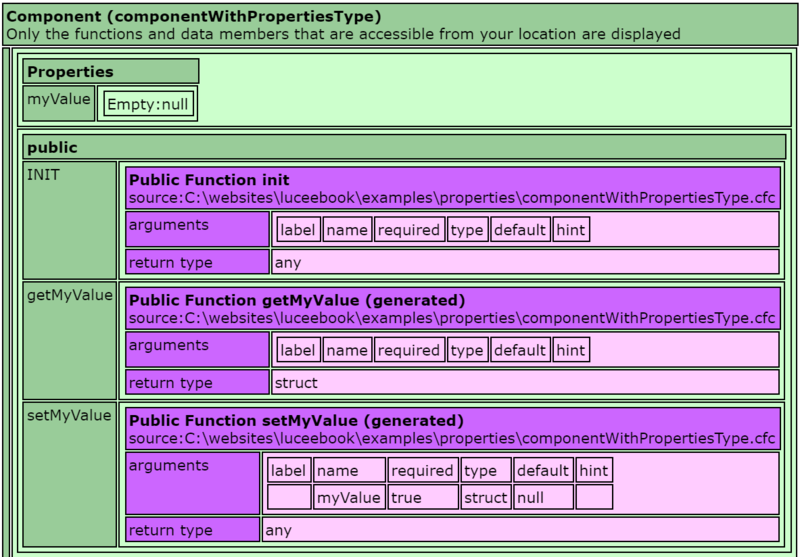 For each property, Lucee will generate a getter and a setter function. This example above merely outputs Hello! If a particular property should not have a getter or a setter, tell Lucee to not generate it by setting getter=false or setter=false for that particular property. This is most often used to disable setters in which the value is handled by the internals of the component. In this example below, it tries to use the setMyValue() function but it will throw an error (component [componentWithPropertiesOverride] has no function with name [setMyValue]), which is expected, because this function was not generated by Lucee. 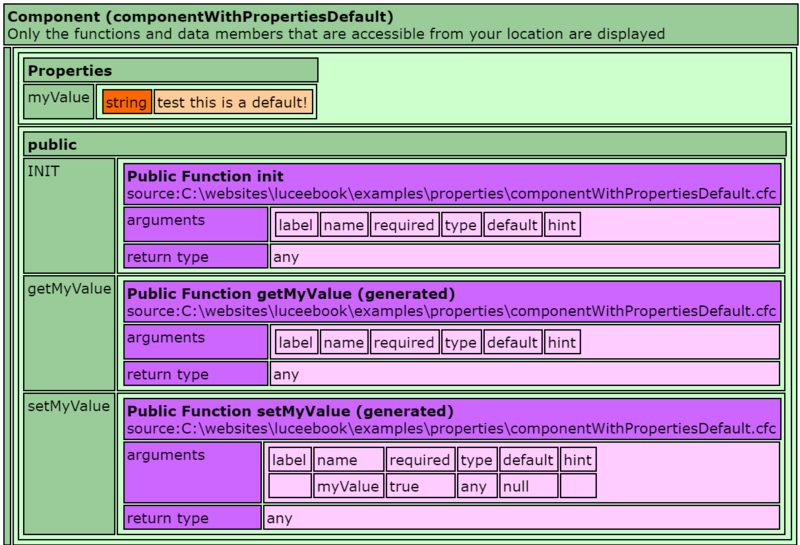 The difference here is the myValue property has a default without any code setting it in the constructor. The following example shows using this default property value and will echo test this is a default! Only simple values can be set in the default. 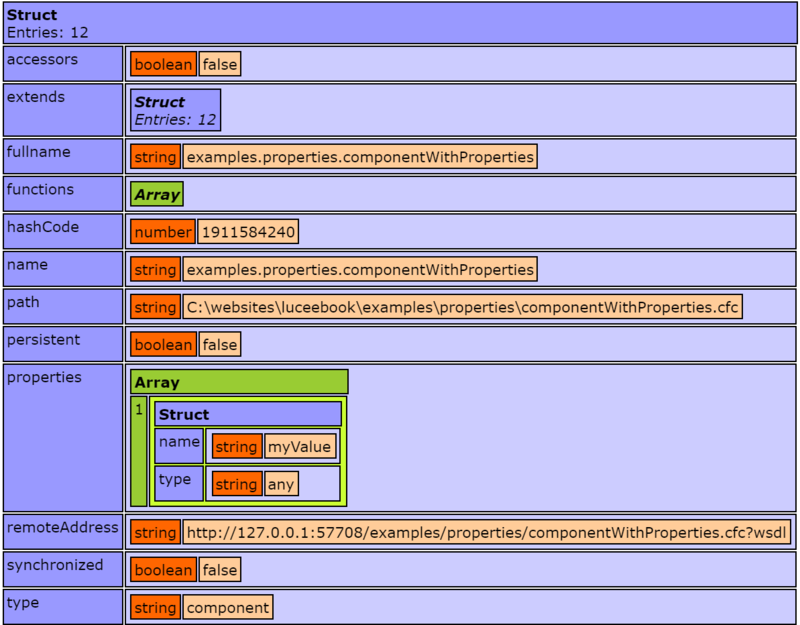 Complex values should be set in the constructor of the component. When dumping, notice the type annotations for the generated methods. The "Return Type" for getMyValue is now &apos;struct&apos; and the arguments for setMyValue require a struct. Also be aware that providing a default value with a type will have no effect on the checking of the default value during creation. The type annotation only affects when calling the setter or getter. Note, we have not defined an init() constructor. Automatic property population only works without an init() constructor defined. If you define a custom init(), it will take precedence over Lucee calling the setters and the value will not be set. When using the population method above, it is not possible to define a constructor which validates object state, because defining such a constructor cancels the automatic populating. State either needs to be validated by defining customer setter methods for each property, or by manually calling a defined validation method after instantiation. Components with generated accessors (by defining accessors=true) can validate the data passed to the setter method automatically. This can quickly speed up adding complex type assertions to components without writing a lot of boilerplate code. Adding validation to properties makes use of two attributes, validate for built in validation types, and optionally validateparams to additional custom validation types. creditcard A 13-16 digit number conforming to the mod10 algorithm. email A valid e-mail address. eurodate A date-time value. Any date part must be in the format dd/mm/yy. The format can use /, -, or . characters as delimiters. regex Matches input against pattern specified in validateparams. ssn A U.S. social security number. telephone A standard U.S. telephone number. UUID A Home Universally Unique Identifier, formatted &apos;XXXXXXXX-XXXX-XXXX-XXXXXXXXXXXXXXX&apos;, where &apos;X&apos; is a hexadecimal number. Additionally, the optional validateparams attribute can specify additional constraints required by the type specified in the validate attribute. This should be specified in the implicit struct notation.